Derived from the Persian word “yasmin,” which means “fragrance flower,” Jasmine has a sweet, romantic fragrance from flowers that are known to bloom at night. 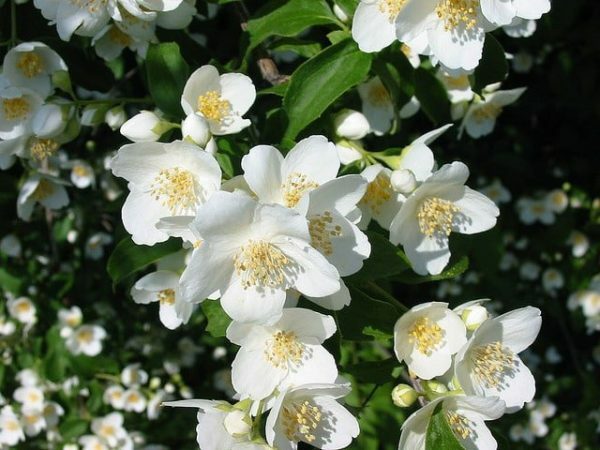 Used to make tea, flavoring syrup, perfume, incense, and essential oil, Jasmine has been popular in marriages, religious ceremonies, and festivals for decorative purposes, and is often included in ready-made garlands in India. Long used for its health benefits as well as its lovely smell, jasmine has also been found to nourish skin, help even skin tone, and protect skin from environmental stressors. This sweet flower will not only impart a romantic scent, but will give you a quick pick-me-up. Jasmine is a genus of shrubs and vines that belong to the olive family. It contains around 200 species native to tropical and warm temperate regions of Asia, Africa, and Australia. These can be either deciduous (leaves falling in autumn) or evergreen (green all year round), and may be erect, spreading, or climbing shrubs and vines, with white or yellow flowers in clusters. Berries turn black when ripe. People typically grow jasmine for the flowers, which open between six and eight in the evening when the temperature starts to go down. Some varieties thrive in cool weather, while others do better in warm weather, with the outdoor varieties thriving in full sun with fertile, well-drained soils. Indoors, plants need bright, indirect light and regular watering, with weekly feedings with a high phosphorus fertilizer. Historically, jasmine was used in many ways to provide health benefits. The Chinese used the stems, petals, roots, and leaves for pain relief. They also used the flowers to ignite passion. The roots were used internally to treat headaches and insomnia, and were reported to have anesthetic properties. Anti-aging: Because of its antioxidants, jasmine can help protect from environmental stressors. This can help give a youthful appearance to your skin. Even skin tone: Jasmine can help. The oil is very effective in evening the tone of skin as well as reducing the appearance of age spots. Moisturizing: Like many natural oils, jasmine oil helps treat dry skin and provide natural moisture that won't clog pores. Non-irritating: Jasmine Sambac, a variety from Hawaii, is perfect for those with finicky skin temperaments, as it's non-irritating and non-sensitizing. It's also great for dry, greasy, or sensitive skin, as it helps to balance all types without irritating. Natural scent: We can't deny the lovely scent that this flower has—so adding it to skin care helps to pick you up as well as nourish your skin. In any product, jasmine provides a delightful scent, but in our formulas, you'll also enjoy the anti-aging, hydrating, and protective benefits. Do you like the scent of jasmine? How do you use it in your house? Photo courtesy Kpjas via Flickr.com. High amounts of benzyl alcohol can impart a noticeable floral-like scent to products, as it is part of the fragrance makeup of some essential oils such as jasmine (Source: Journal of Agricultural and Food Chemistry, March 2007, pages 1,737-1,742).